This past season (2014-2015) was our team’s rookie year. When we started out on our adventure we had no idea what to expect. We had no name, no history, no parts, and we didn’t even know if we could build a working robot. Thankfully, with the help of many gracious individuals, organizations and teams we made it through the year with a cool name, a reputation as an enthusiastic rhyming team, plenty of supplies, and a working robot! We started the season by attending workshops and events that were great opportunities for a new team. One of these was a brainstorming session hosted by MOE and Dr. Cheek. After months of designing and building our robot we attended two qualification competitions in Pennsylvania. We were honored to win the Motivate Award and the Think Award. After a lot of testing we decided that our first robot design was not working effectively. We ended up changing a major component of our robot the week before our first state– level competition. Although it was a good change our robot struggled at Delaware States due to a major mechanical issue. We ended up winning the Think Award again at this competition. Two of our members, Emma and Amy, were also chosen as finalists for the Dean’s List Award at DE states. We finished our competition season by competing at Pennsylvania States. We won the Connect Award which was one placement away from qualifying us to Super Regionals. However, our season was still not done. We helped FSR host the premier event of Dean Kamen’s documentary “Slingshot”. It was a big success and we raised a lot of money for the teams that are a part of FSR. We’ll be working all summer to spread STEM throughout our community and to prepare for another great season. To see the team at work offering robot demonstrations during Robotics Day event, click here To learn more about the team, visit their website….here. 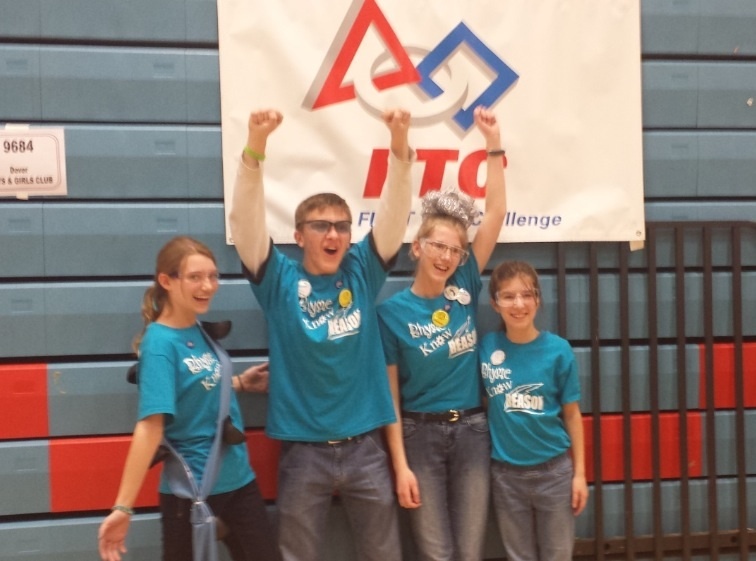 This entry was posted in News and events and tagged FTC, Rhyme Know Reason, robotics, STEM, youth by fsreditor. Bookmark the permalink.